Most beginning quilters wonder if they should prewash their quilting fabrics before cutting them into pieces and using the pieces in a quilt. It's a topic with no absolute answer because everyone has a different opinion about prewashing. Some cotton fabrics bleed, which means the dyes become loose in the wash. the problem is usually most noticeable in reds, purples, and other vivid colors. Bleeding dyes can stain sections of other fabrics during prewashing, but they're an even bigger problem when they transfer dyes onto patches in a finished quilt. Unwashed fabrics can also create a problem called crocking, where dry dyes transfer onto adjacent fabrics. Test fabrics by performing a bleed test before you use them in a quilt or wash them with other fabrics. Keep a laundry additive called Synthropol on hand. A cap of Synthropol added to each load of fabric keeps loose dyes from depositing onto other fabrics during the wash. Do beware, however—the product won't prevent fabrics that are attached to each other (like patches in a quilt) from absorbing dyes that bleed and transfer to adjacent fabrics. When a cotton fabric is manufactured, threads are stretched on a loom, pulling fibers into an unnaturally straight position. Coatings are added to help stabilize the threads and keep them taut. Part of what we see as shrinkage is actually the relaxation of the cotton fibers as they try to return to their natural state. When fabrics are washed, the agitation of the washing machine and the wicking action that draws moisture into the fibers allows the coated threads to relax and return to a position more like that in which they grew. Putting the fabrics in the dryer gives fibers another opportunity to relax. How much? It depends on the fabric. What if your quilt block contains several different unwashed fabrics, and some of them shrink more than others? Uneven shrinkage could cause puckers and distortions the first time the quilt is washed. Quilters sometimes intentionally use unwashed fabrics to assemble a quilt because the puckers left over after the first wash give the quilt a vintage appearance. If vintage isn't the look you're going for, however, it's best to prewash your fabrics. Quilting fabrics arrive from the manufacturer coated with sizing, protective agents, and other chemicals that give the fabrics a crisp feel and make them easy to rotary cut. If you are sensitive to chemicals, handling coated fabrics or breathing small particles that might flake off of them could be a health risk. If you prefer to work with stiffer fabric, use spray starch or sizing to reintroduce body. Yes, that adds a chemical, but it's one you can control. Read the ingredients list on the can to find out exactly what's in each product. Many quilters like to work with a starch alternative called Best Press. Wash your cotton quilting fabrics in cool water with a mild detergent or Orvus soap, which is available online and at most quilt shops. Keep wrinkles to a minimum by drying fabrics with low heat and removing them from the dryer as soon as they are dry. Some quilters like to press fabrics right away. Some people prefer to press fabrics when I'm ready to use them in a project. After removing fabrics from the dryer, you can use clothespins to suspend segments from hangers until they're completely dry, then fold the fabrics and stash them away. 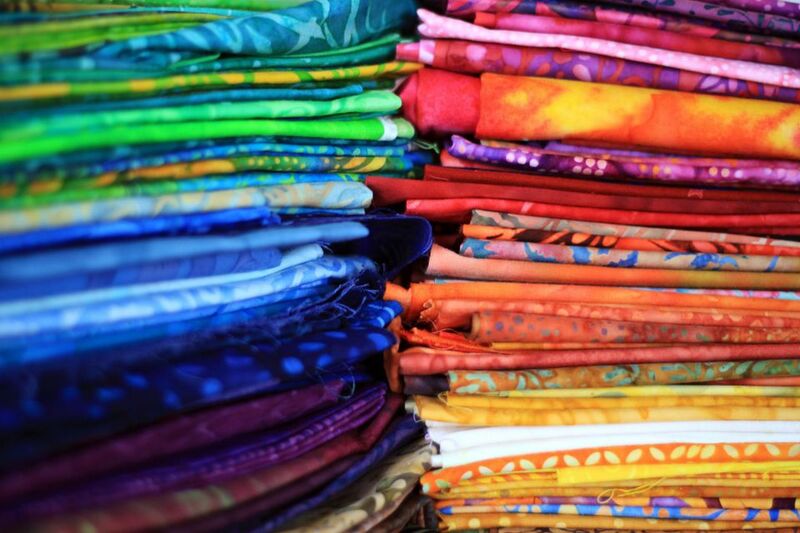 You'll develop your own preferences for prewashing as you work with fabrics and construct your quilts. Ask other quilters for their opinions on care, listen to what they say, then experiment to determine which techniques work best for you.